Multitalented, socially minded business consultant Michelle LaDuke Senglaub has beauty and brains. Michelle LaDuke Senglaub spent the last 20 years of her career as a writer and marketing/business communications consultant for non-profits, tech companies, and a sales training and development company, plus a five year-stint as a sales advertising consultant for Forbes magazine, specializing in economic development. She's been busy! 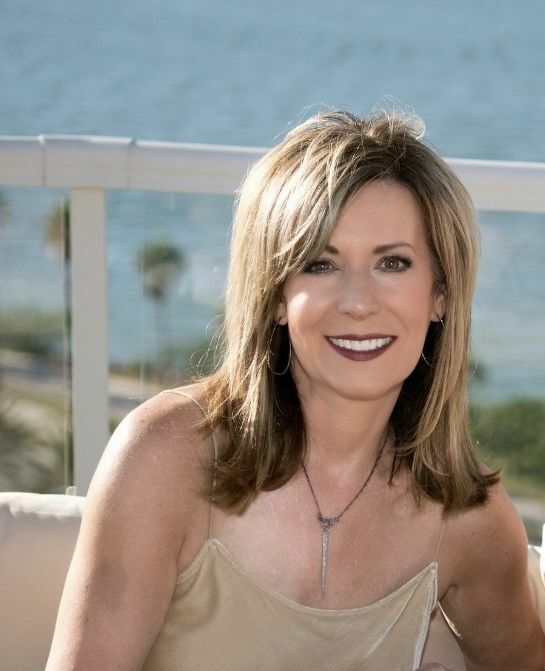 It's difficult to believe it's only been five years since Michelle moved to Sarasota, when her husband’s company relocated its headquarters to the area. It feels as though she's always been a part of the social fabric here. Since the move, Michelle telecommuted for about three years with a main client, then opted to whittle down her consulting work to spend more time on charitable work with several local non-profits. Not one to rest on her laurels, Michelle's current labor of love is assisting with the rewrite and launch of a new website for Girls Inc. of Sarasota, where she also serves on the board. So, how does she do it all, and stay young and fit? That's what I wanted to find out. First thing out of the shower, I use sunscreen head to toe, every day, rain or shine. I cleanse with Cellcosmet cream cleanser and toner, and then follow with their CellLift serum and Ultra Vital cream, blended with a couple drops of Trish McEvoy Beauty Booster oil. Depending on the day and the coverage I need, I’ll either use Dior AirFlash foundation or Chanel Le Teint Ultra Tenue, and a combo of Trish McEvoy and Chanel for bronzer, eyes, cheeks and lips. During event season, I opt for a bolder lip color from Dior or Tom Ford. My mom was never a big one for makeup, but she is one of the most genuinely kind, loving and generous people you could ever meet. The older I get, the more I realize that her good heart, giving spirit, great sense of humor, and positive attitude are what make her truly beautiful, inside and out. I only hope a little of that rubs off on me. I try to eat as little processed food as possible, follow a mostly Mediterranean diet, and I’m a huge believer in essential oils. I’m also fortunate to be able to work with Chaz Glunk of Body by Chaz three times a week. We’ve been working together for about 18 months now, and he has helped me reshape my body and develop a strength that I never knew I had. I also try to walk as much as possible (my dog Lily helps with that), and I aspire to get into yoga one of these days. I used to travel a lot for business, and I discovered several years ago that a good blowout is worth every penny when you have to get out the door for a 6 a.m. flight. I have regular blowouts, color and highlights with Corinne at The Ritz-Carlton. I also try to get in for a facial and massage once a month. Nichole at L. Spa is my go-to for a manicure and pedicure every two weeks, and I love my lash extensions from Sara at Shoko Lash Studio. I cleanse with Cellcosmet and my Clarisonic again at night, then follow with Cellcosmet’s Ultra Vital moisturizer and eye cream, and a good hand lotion. Once a week, I’ll use a Trish McEvoy peel. I also recently discovered Microjuvenate, and use that a couple of times weekly. I’m a Gemini, so my scent really depends on my mood and where I’m going. Chanel Eau Premiere is my typical go-to scent, but right now, I’m missing Italy, so I’m loving Tom Ford’s Mandarino Di Amalfi. I also love Jasmin Rouge from Tom Ford and Good Girl Gone Bad from By Kilian. What is the biggest beauty blunder people make? I think it’s probably a toss-up between people who over-tan, and those who overuse fillers or plastic surgery. I think in either case, a little bit can go a long way. Learn to embrace the fact that each one of us is our own version of beautiful, and we are never going to be perfect. The more time I spend at Girls Inc., the more I aspire to be like our girls. They are strong, smart, bold, sassy, self-confident, and above all else, they believe in themselves. We could all learn a lot from them.